It isn’t the law here in Denmark to wear cycle helmets and whenever it is mooted it never seems to happen. I wonder if it is because we have a sense of security by using a lot of dedicated cycle paths rather than having to weave around car traffic or the awareness of car drivers to the large cycling population. Maybe it’s a vanity thing. Whatever it is, I see very few cyclists wearing helmets beyond the more sporty ones on my commute to my son’s school or any other time of the day for that matter. 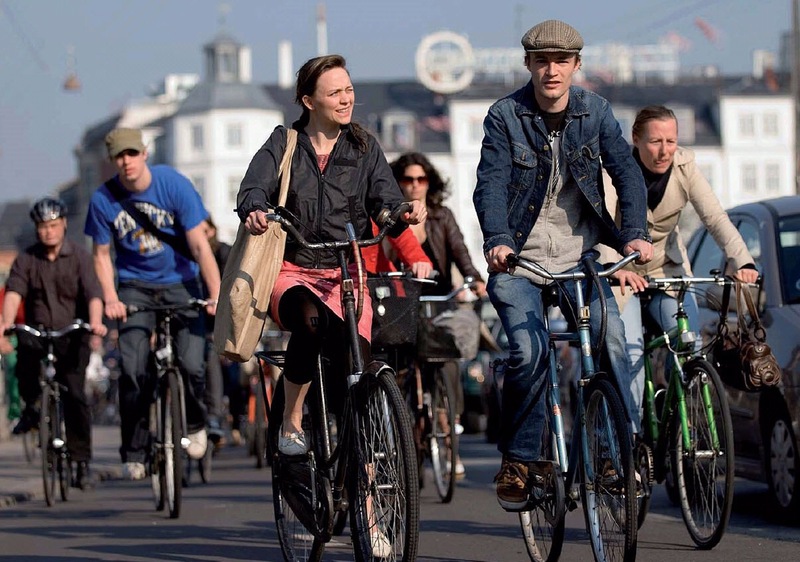 In fact recent figures suggest that only 17% of cyclists in Copenhagen wear helmets. Some very interesting arguments are raised here. There are a lot of arguments that suggest studies have over estimated the safety benefits of cycle helmets. Also many cycle accident related injuries are similar to mine and not head injuries. When I was a teenager I worked in Halfords selling, amongst other exciting items, cycle helmets. The biggest thing we were taught in our training was that unless a helmet is worn correctly it is useless. In the UK you can regularly see cyclists wearing helmets pushed back on their heads, exposing their forehead, which according to what I was taught renders them useless. However after smashing my elbow up and becoming the Bionic Woman last month, I am aware that I could have smashed up my head instead. And that is something of a sobering thought. I am still, however, unsure about wearing one. I am not sure how I will feel once I get back on a bike in a few months – whether the feeling of security will take time to return. I am also not sure if the next time I mount my bike I shall be wearing a helmet. I am not sure if it will make a difference in an accident, research suggests not in the kind of cycling environment I exist in but nevertheless I am giving it careful thought. I am interested in your views – if you cycle here (or anywhere else for that matter) do you wear a cycle helmet? Hi, I’m from Manila, Philippines. I always wear a cycle helmet whenever I ride. Road conditions, traffic laws, and driver discipline here is not as good as in your country, so I would rather invest in riding with some sort of protection than nothing at all 🙂 I hope you’ll be able to go back to riding soon! Take care! Hi, I don’t wear one here in the UK and when cycling last summer in Copenhagen I didn’t wear one. But I got slated on Facebook by my friends when I posted a pic of us on bikes in CPH not wearing one. I tried to explain that none wears them in Denmark as it’s so very safe. The UK could learn a lot from the cycle safe European countries ! It is law in Australia to wear a cycle helmet so I always have to wear one. There have been many debates, mainly ones saying that if we didn’t have to wear one then more people would cycle, about wearing them. They may have done studies to see if they actually protect you but I feel so much safer with one on than not. Sometimes it’s just an aesthetic thing with people as well. First of all accidents happen. People fall down the stairs and out of the bath all the time, but we don’t call for helmets for this activity. Even doing up our shoelaces is pretty dangerous. Secondly, “feeling safer” doesn’t necessarily mean actually being safer. The feeling of safety brings its own problems like riding faster, or taking more risks. A bit of polystyrene on your head can’t can’t give you magical powers. I taught cycle safety to children for many years and always showed the children what happened to an egg if it fell from head height onto a pavement either with or without a helmet (yes I have a special egg size helmet) and found that most children would opt to wear their helmet after the demonstration. I also said that if they ever saw me out on my bike without a helmet I would give them £5. Cycling is such a lovely way to move around. The need to wear a helmet seems quite a contrast to the sense of freedom that bike-riding brings. I live in Australia and, as Helen mentioned above, wearing a cycling helmet is mandatory. Fines are imposed for not wearing them. In recent years, a parliamentary review of cycling in Queensland (where I live) recommended a two year trial for removing the mandatory helmet rule for cyclists (16 years and over) in parks, on footpaths, bike paths and roads where the speed limit is no more than 60km/hour. The minister rejected the committee’s recommendation. I’m an everyday cyclist who enjoys using a bike for transport as much as I can. Where I live on the Gold Coast, there are some good bikeways and I’m encouraged by the local council’s initiatives to encourage active transport. I think it’s a personal choice about wearing a helmet and think it possible that greater participation in cycling (prompted by not having mandatory helmet laws) might bring greater health benefits to the community at large. Thanks for all your comments, great to hear lots of different views on this. Still deciding but I think I will be getting one.